Welcome to Virginia Beach’s quieter side. Away from the hustle and bustle of the oceanfront strip, there are 6 miles of Chesapeake Bay waterfront in the city of Virginia Beach, extending from the Little Creek Naval Amphibious Base to First Landing State Park. The water on the bayside is calmer, a plus is you’re vacationing with small children or if you want to go out sailing from the beach. And the oceanfront strip, with all it’s dining and entertainment options, is just a short drive away. Virginia Beach Hotels: See special offers. First Landing State Park is an oasis of cypress forest, Spanish Moss, and 17 miles of woodland trails in the midst of a resort city. The park gets its name from the fact that the Susan Constant landed here weeks before finally settling at Jamestown. 2,770 acres hold swamps, dunes, cabins, campgrounds, a boat ramp, indoor aquariums, and a large variety of wildlife. The main entrance and visitor center are on Shore Drive. It’s a great place to visit and a wonderful way to escape the crowds at the strip. You’ll feel like you’re in a different place all together. If you bring a boat with you on your vacation, you can put in at the Lynnhaven boat ramp over on the bayside. The Lynnhaven boat ramp and beach facility features 4 concrete boat launch lanes with associated temporary mooring areas, canoe/kayak launch area, boat trailer parking spaces, restrooms with shower and foot rinse areas, changing areas, car parking for beach access, an information kiosk, vending machines and a walkway (under the Lesner Bridge) to the Ocean Park Beach Area on the Chesapeake Bay. Looking for a place to stay? Find the best deal, compare prices, and read what other travelers have to say about Virginia Beach hotels. 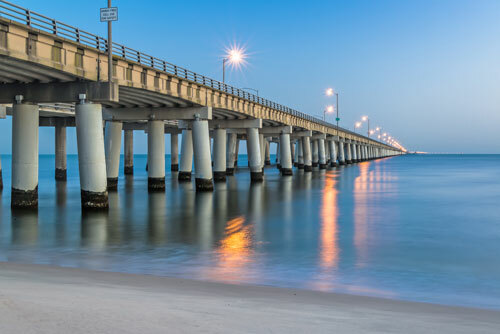 The Chesapeake Bay Bridge-Tunnel is both a tourist attraction and an important transportation link. The 17-mile complex of bridges and tunnels connects the bayside of Virginia Beach to the Eastern Shore of Virginia. “Go to sea in your car” on this engineering marvel. You can stop and get out of your car at the southern island that’s at the base of one of the tunnels. There’s a restaurant there with nice big windows so you can watch the boats go by. There’s also a fishing pier, if you want to try catching something. Or just stop, take a break from driving, and enjoy being out in the middle of the widest part of the bay. If you’re lucky you might see a Navy ship or even a submarine go by. The Adam Thoroughgood House is a historic house museum on the western branch of the Lynnhaven River. Built in the late 17th century, this little brick house recalls the English cottage architecture of the period. Herb and flower gardens. Open 6 days a week for guided tours. The Lynnhaven House is located on five acres of land near the Lynnhaven River which includes a small woods and gardens of herbs, vegetables, flax, cotton, peanuts, and tobacco. Household skills crafts that produced the early lifestyle are still practiced here. Docents in 18th century attire provide tours of the furnished home. Virginia Beach Resort Hotel and Conference Center. All suites resort hotel with 295 bayview rooms on the sandy beaches of the Chesapeake Bay. Virginia Beach Vacation Rentals Rent a home at the beach. Verizon Wireless Amphitheater brings big-name musical acts to the city. It has a total capacity of 20,000, with 7,500 reserved seats under the pavilion roof and room for 12,500 on the “festival lawn”. Under cover or under the stars on the lawn, it’s a good place to hear a concert. The Mariners are Virginia Beach’s professional soccer team. The play at the Sportsplex in the southern part of the city. See Virginia Beach real estate listings. The City of Virginia Beach’s home page. Virginia Beach Convention and Visitors Bureau. Visitor information. The Virginia Aquarium. Marine science center. Naval Air Station Oceana Tours. Information on official navy air station tours. Virginia Beach Restaurants. Looking for a place to eat in Virginia Beach? Look here for ratings and reviews. Virginia Beach Golf Courses. Golf course information and maps from TheGolfNexus.com. Virginia Beach Hotels and Attractions. Virginia Beach Amphitheater – Outdoor summer concerts.